Peter Rabbit has no appetite which is very unusual for Peter. After thinking about it, Peter decides it is loneliness that affecting him. He decides to leave the Old Briar Patch and see the Great World, starting at the Old Pasture. After a close encounter with an old nemesis, Hooty the Owl, Peter discovers that he is still lonely. He discovers that he has moved into Old Jed Thumper who wants nothing more than to chase Peter away. Peter also discovers that Old Jed Thumper has a charming young daughter, Little Miss Fuzzy Tail who Peter falls for. Their relationship quickly blossoms, and leads up to a wonderful surprise ending. 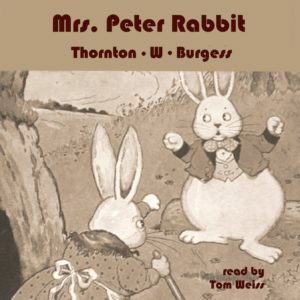 As with most Thornton Burgess books, young listeners learn valuable lessons about nature, wildlife, and positive morals. Thornton W. Burgess was a conservationist and author of children’s stories. He loved the beauty of nature and its living creatures so much that he wrote about them for 50 years. By the time he retired, he had written over 170 books and 15,000 stories for a daily newspaper column. Get the Kindle book with illustrations so your child can read along. Just click on the image below.